The simple answer is that an electric machine is better. Just think about it; electric machines eliminate the need to pull a handle to punch a few pages at a time over and over until your whole book is punched, they can usually punch a higher capacity at once, they remove what some consider tedious steps, and they can increase the production speed pretty significantly. But along with those benefits, electric machines are also more expensive...so they are not a great choice for all kinds of businesses. If you're torn between a manual and electric binding machine --not sure whether or not the additional cost for the electric model is worth it-- then there are a few things to ask yourself before you make your investment. When you answer these questions with your operator and your business needs in mind, you should have a better idea of if an electric binding machine is worth the money, or if you should stick with a manual model instead. 1. What is your volume? Are you binding less than 20 books per month? Are your books on the thinner side, requiring only a few punched stacks per book? Is these are the case for your business, than a manual punch with manual bind will likely do just fine for your needs. If your business binds closer to 70+ books per month, or making thicker books, then have either an electric binding (especially helpful for thick coil books) or electric punching might be worth the additional investment. 2. Who will be using the machine? Whether manual or electric, these punch and bind machines are all failry simple and only require a little review of the settings to get the hang of them. If you are going to have a single user on the machine who is strong, then they may be able to handle the more manual process even for larger quantities. 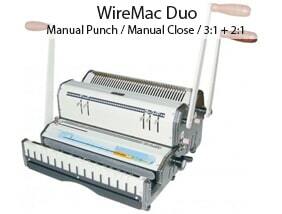 Whereas an older employee might prefer the convenience of electric punching. Sometimes when manually punching thicker stacks, it can be difficult to pull the handle through, so it can be labor-intensive. An electric punch eliminates that. Now that you know the most important considerations, let's do a quick overview of the binding machine variations, because they are not always cut-and-dry manual or electric; many have a combination of both features. We discuss these differences below, as well as our most popular binding machines for each option. 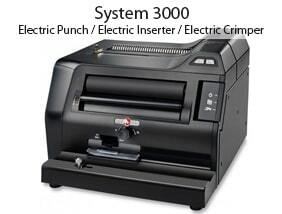 These machines were chosen because theyhave high customer reviews for quality, performance, and value. 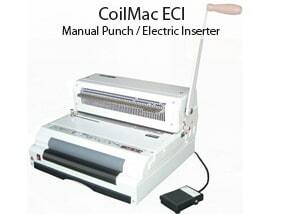 There are 5 coil binding machine combinations. 1) manual punch with no inserting rollers, 2) manual punch with electric roller inserter, 3) electric punch with no inserting rollers, 4) electric punch with electric roller inserter, 5) electric punch, electric roller inserter, and electric crimper. Because of these variations, comparing a simple manual to electric for coil binding isn't as simple as it may seem. As more electric functionality is added, the machines go up in price. 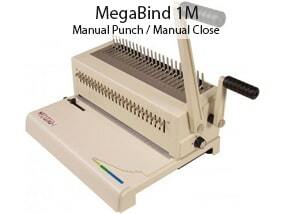 The punch on a manual coil binding machine is done with a handle. On an electric machine, it is most commonly done with a foot pedal, but some machines have a push button. The roller inserter is usually a push button that makes one of the rollers spin continuously until you push the button off again. Machines without the electric rollers require you to spin the spiral plastic coils through all of the holes by hand. A select few spiral binding machines also have electric crimper. 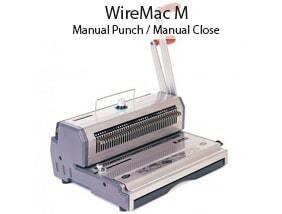 Machines without this will need you to use a manual hand crimper or have a separate electric crimping machine. Wire binding is a bit different, as there are only 3 different wire binding machine combinations of manual and electric features. 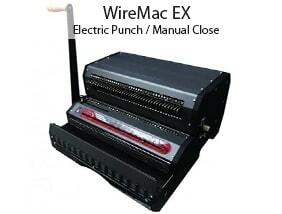 1) manual punch with manual closer, 2) electric punch with manual closer, or 3) electric punch with electric closer. An all-manual wire binding machine will punch your pages by pulling the handle, and will close the wire spine by pulling a different handle. On the electric punch machines the action is usually done with a foot pedal, and on the rare occasion, with a button. On the all electric machines you would have a foot pedal for the punch and a button for closing. 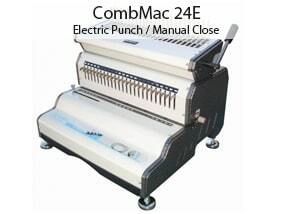 Manual and electric comb binding machines come in 2 variations. 1) manual punch, manual opener/closer, 2) electric punch with manual opener/closer. 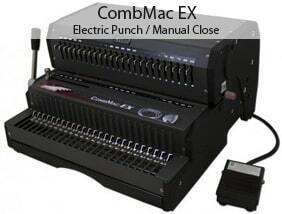 There are some modular separate electric comb opener/closers available, but the punch machines don't usually have that option. 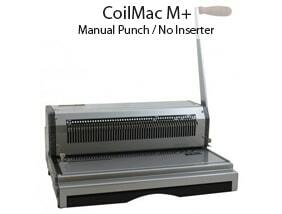 Both functions are performed with a handle when manual, or the punch with a foot pedal when electric. The plastic gbc combs are opened by pulling the handle one way, and then closed by pushing it back. Again, some smaller electric comb punches might have the push button activation instead. Now that you have reviewed some of the key points necessary to make the best buying decision for your business, how are you feeling about the manual vs. electric binding machine conundrum? If you still need some guidance, please call our experts at (866)537-2244 (866)537-2244 for one-on-one care to help you decide.